Some Perry Miniatures 28mm 8th Army / SAS types. First up are some WIP British infantry. Not too much more to do on them – a bit more definition on the weapons, some tidying up with final highlights and basing (which I’ll do by the section). This half-section is my colour test and a bit of practice for an ‘on the table’ quickish paintjob. Brass front axle with turn on the front wheels. Brass Vickers K mount – more to scale and straight! New mount and placement for the third K gun. Head-swaps using heads from the 8th army plastic boxed set (I liked the flowing head-dress). Umming and aahing about swapping the grab-handles but probababy can’t be bothered. It’s not a very fun job and I really want to start painting this. This entry was posted in 28mm, Vehicles, WIP and tagged 28mm, 8th Army, Perry Miniatures, SAS, World War Two. Bookmark the permalink. 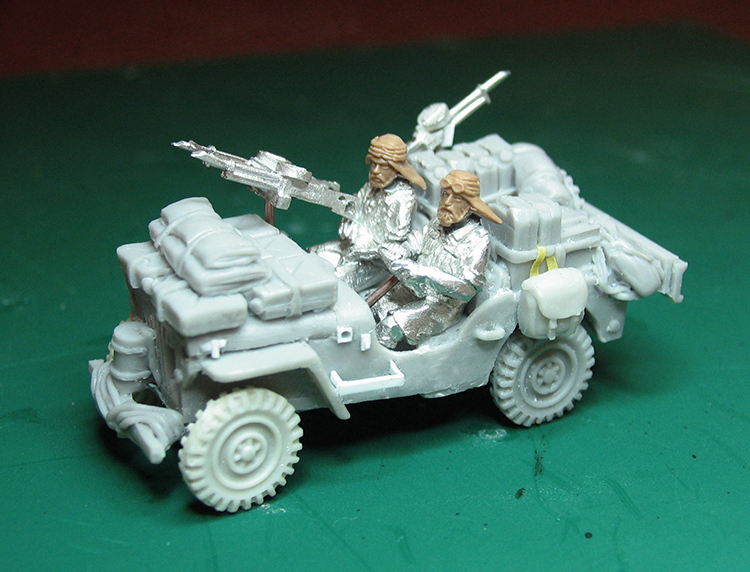 And good to see the SAS jeeps, nice bit of detailing there. I’ve got 1 Desert and 2 European ones to do on the bench now. Got the basic assembly done but boy they had some moulding and alignment issues! Cheers Brent. Thanks for stopping by. Yeah the jeeps were a little rough and ready, but scale-wise they look far better than anything else in 28mm. I guess that’s an advantage of the Perrys using ‘true scale’ 1/56th. This is my homage to the Tamiya SAS Jeep which is still one of my all-time favourite 1/35th kits. Yeah I almost brought the Tamiya one recently to build as a bit of a nostalgia trip, it was one of the very first kits I ever tried to build. 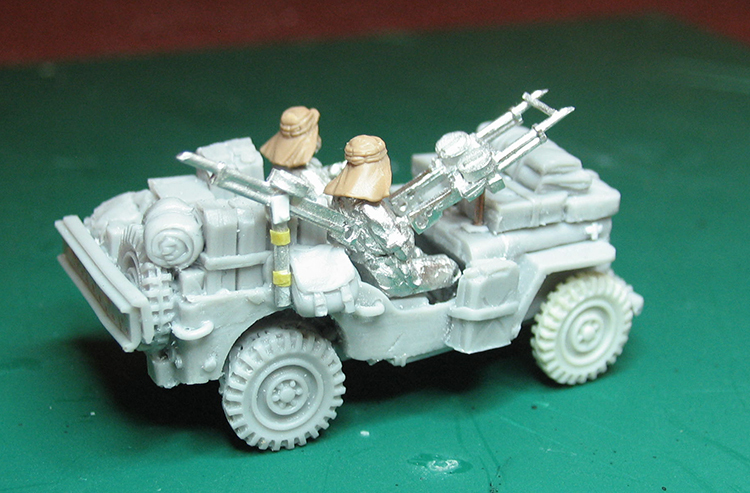 The Jeeps I have here are the Warlord ones, The stowage detail is nice but some things were really poor. it’ll be interesting to compare each others builds as we go – better get my A into G then ! How did your Perry British Infantry come out? I fell in love with the models but have had a difficult time painting them to a standard I’m happy with due to the lower level of detail. I’m a lot more comfortable with heroic scale, especially when it comes to painting faces. Would you ever consider doing a walkthrough on how you paint Perry faces? Hi. I’ve not really considered doing tutorials (wasn’t sure anyone would be interested) but I’ll have a think. These came out quite nicely in the end, but I think the Vichy French perhaps are better because they were more recent and a bit more subtle. I really like painting Perry faces in general. The odd one or two can need a bit of tidying before painting but overall they are expressive and realistic. I don’t go mad in perhaps the same way I do with the ‘heroic’ 28mm figures (see the more recent Empress US figures I did this year for example ) but keep things a bit simpler and cleaner. I’ve just about completely stopped painting eyeballs on the Perry figs if I’m doing batches for gaming with just a suggestion with black-brown paint. Eyebrows help a lot though! Sadly most things are in storage after a move to Germany so I can’t update the pictures here. I do have more to do though so will try to do some closeups at least.